With its efficient use of resources, abundant natural daylight and fresh air, and modern technologies, this 856,000-square-foot building designed by Foster + Partners and completed in 2006 is the first in New York City to receive a LEED Gold rating for its core, shell, and interiors. Most notably, it was constructed using more than 80% recycled steel. The diagrid framing uses 20% less steel than conventionally framed towers, and it was designed to consume 25% less energy than most Manhattan towers. 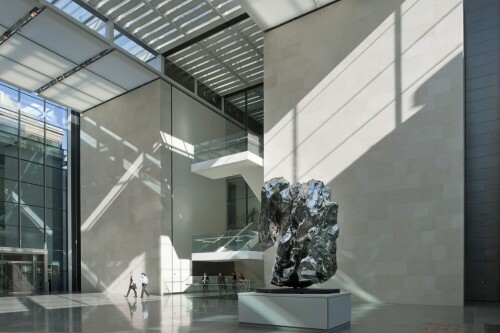 The original, landmarked cast-stone façade by Joseph Urban and the new tower are linked on the outside by a transparent skirt of glazing that floods the interior spaces below with natural light and gives the impression that the tower is floating above the base. The building’s main spatial element is its atrium lobby – a vast internal piazza. It occupies the entire shell of the original building and features a 340-seat company cafeteria, the 168-seat Joseph Urban Theater, and exhibition spaces. A series of diagonal escalators take riders from the street-level lobby to the atrium level. They are between two halves of Ice Fall, a cascading water-and-glass sculpture designed by James Carpenter, which cools and humidifies the air. 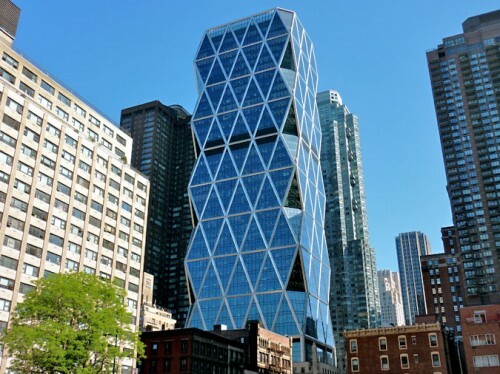 Writers, like architects, are constantly scrambling for work, so in uncertain times, the construction of two monumental buildings for the print media (also the New York Times Building) gave hope to writers that their craft could sustain big buildings. Each “Building of the Day” has received a Design Award from the AIA New York Chapter. For the rest of the month—Archtober—we will write here a personal account about the architectural ideas, the urban contexts, programs, clients, technical innovations, and architects that make these buildings noteworthy. Daily posts will track highlights of New York’s new architecture. Read more at www.archtober.org/blog. The official Foster + Partners design has (finally) been released for the new Apple campus in Cupertino. At a recent Cupertino City Council meeting Steve Jobs said he was excited to centralize his campus with a building for 12,000 employees on a site currently dominated by parking lots. 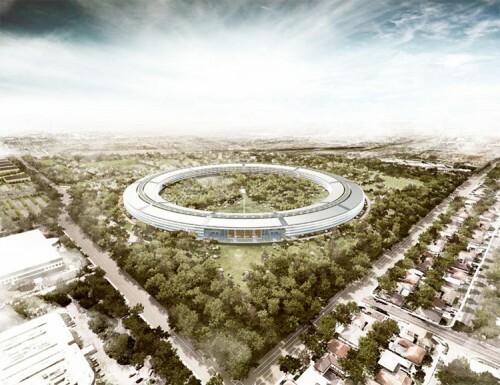 In the time since the Cupertino meeting, the not-so-secret news that Foster & Partners designed the giant ring has also been confirmed. The low-lying complex, described as being built at a "human scale" and largely off the grid, is expected to open in 2015. In reference to the overall design and the building's glass curvature Jobs noted, "It’s a little like a spaceship landed." Microsol Resources' Tuesday night presentation of Z Printers at Cooper Union was notable for scale of output, both small and large (very large). The 3-D printers produce a powder-based model where all unused excess material gets recycled within the machine. 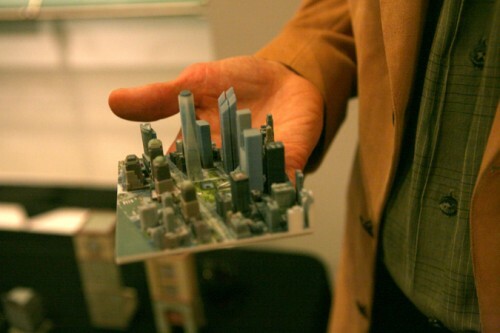 The copier makes tiny models with extraordinary precision. The prices run from $15,000 to $65,000. But a panel of four presenters said the printer's primary advantage is speed, allowing for new models to be created within 24 hours. Two firms made notable presentations. Xavier De Kestelier, an associate partner at Foster + Partners, veered from the script a bit when he showed a video of a cement printer being developed at Loughborough University in the UK. That hanger sized 3-D printer makes modular units that can be adapted as building components. Then, Wesley Wright, a designer with Pelli Clarke Pelli, brought the conversation back to the Z Printer, which he said has become an integral part of the firm's design process. The firm has four machines operating round the clock. Sketching right onto the models during the review process is not uncommon. In a video, no less than the maestro himself, César Pelli, intones on the importance of model making in general and on 3-D printers in particular. Wright has graciously, and exclusively, shared his video with AN. We nabbed the Foster/Loughborough video from YouTube. (Scroll down for the videos!) Pelli on Models from Architect's Newspaper on Vimeo.